have understanding and compassion for ourselves and others. opportunity to heal and to move forward in life. At One Heart, we offer the One Heart Flower Essences, the Magdalene infused flower essences from the Languedoc region South of France. The Languedoc region is still pristine and uncontaminated producing the most beautiful and healthy flora, but more importantly, this is the region where Mary Magdalene lived and shared her healing wisdom after she fled Palestine. Her consciousness and blessings are infused in all the essences. Our experience shows us that this flower essence system is one of the best available on the planet today for its ability to help with the current issues facing mankind in the 21st century. The focused intent of this flower essence system is to heal our past wounds, release pain and erroneous concepts as part of our journey to health, balance, wellbeing and growth in consciousness. The 35 One Heart Flower Essences and 7 synergistic blends are an invaluable aid in assisting us to move into a state of Oneness. We also combine the Magdalene flower essences with the highest quality essential oils available to create very effective Aura sprays. These sprays are easy to use, portable and applicable to any healing practice, meditation practice, home or office use. We invite you to explore these wonderfully subtle yet powerful essences – whose time has come to help us at this stage of our evolution. Q. What are flower essences and how do they work? “Flower essences are vibrational remedies that assist us in achieving optimal physical, emotional, mental and spiritual health. They help us reach our highest potential by flooding our body with positive energies that resonate with our true nature – our ability to love, to forgive, to be compassionate, to share wisdom, to have understanding and compassion for ourselves and others. By strengthening these qualities in us, we afford ourselves the opportunity to heal and to move forward in life”. Q. What’s special about the One Heart Flower Essences range? The Languedoc region of the South of France has traditionally been a place of healing & rejuvenation, where people have come from all over the world to enjoy and take advantage of its healing & vitalising waters, pure, healthy & nourishing foods and abundance of Aromatherapy oils and Herbal remedies. Indeed, the water, the soil, and the very air one breathes while walking the land are imbued with a heightened frequency that is nurturing, elevating and exalting. One cannot help but feel the powerful healing energies of this land. In addition, this region is also home to Mary Magdalene and her Sacred Feminine lore. 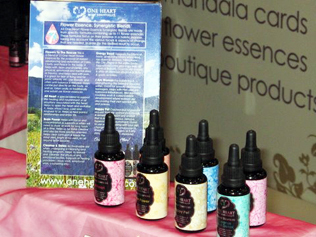 The One Heart Flower Essences are infused with her healing energies. The One Heart Flower Essence remedies are particularly effective in strengthening and magnifying our Soul’s Light in our bodies and as such they carry a strong healing energy that is both powerful yet gentle. They have been given to us to help lift up and expand our consciousness, so that we can live our lives with more enlightened awareness, and with a greater sense of joy, peace and wellbeing. They are the perfect remedy to assist us in the 21st century and their healing abilities are specifically matched to alleviate the current human problems and concerns of our times. Q. How are flower essences made? One Heart Flower Essences are infusions of wild flowers in source water, gathered from sacred sites in the Languedoc region. The flowers leave their vibrational imprint in the water which is then stabilized in brandy. They contain no scent and are different to essential oils and herbal tinctures. The One Heart Flower Essences are prepared using source water (water coming right out of the mountains) of the areas where the flowers grow. Source water is living water of high vortexian energies and is more capable of carrying and transmitting the electromagnetic healing energies of the flower. This process is an alchemical process, which involves the flower essence maker, the plant and flower, the building and over-lighting devas of the plant, the Sun and Water. As such it is a sacred process which cannot be duplicated by machinery. It also follows that the more ‘pure’ the flower essence maker, the more potent the flower essences made by them will be. Q. How do I take the flower essence and for how long? The One Heart Flower Essences are generally taken 4 drops under the tongue 4 times a day for at least two weeks. In some cases, usually when the problem is persistent or multi faceted, the essences may need to be taken for a longer period. The idea is to repeatedly flood the bodymind with the alchemical synergism of the healing essence(s) of the flower(s), source waters and sunlight. Once the body is attuned to the new high frequency of the flower essence it will no longer need the remedy. Q. How safe are they? Flower essences are completely safe and natural. They are free from side effects and adjust to the needs of the individual taking them. It is not possible to overdose or injure when recommending them. If an inappropriate remedy is chosen, it simply will not work and will do no harm. Adults and children, as well as animals and plants can use Flower Essences for great benefit. Q. What are the real benefits? Most of us are functioning with certain beliefs and driven by certain emotions that are harmful to us and that create stress in our lives. Emotional and mental stress not only lower the immune system, but they can contribute to serious illness, The flower essences help us ‘change’, release and heal these issues, and restore our health and sense of wellbeing. The One Heart flower essences not only improve the quality of our life they also help to give us clarity, courage, strength and commitment enabling us to pursue our goals and dreams. In addition, they also help us to develop a higher level of intuition, self esteem, spirituality and creativity. For more information about the One Heart flower essence system please view the video. And you can attend one of the upcoming workshops with Carol.